A Christmas Decoration You Can Make! My friends will tell you that I’m ‘creative’. I love coming up with an idea, getting all of the bits and pieces I need and assembling them to make whatever it is I set out to acheive. Unfortunately these days I spend more time in admiration of what other people are creating than I do on my own ‘creativity’ – give or take a few trinkets. Any time of year is perfect for making and creating but there is something about christmas that gets the creative juices flowing. In the past it has been the wonderfully inspiring Christmas Edition magazines. But now there’s Pinterest, Instagram, many more magazines, and blogs, blogs, blogs. If you can’t find something to make/create on the plethora of social media chanels than you must be looking with your eyes shut! It’s time to open your eyes, because I can now say that this blog, yes, the wonderful Gardens And Polka Dots has contributed to the aformentioned plethora of creativity… Yep, I made a Rosemary Christmas Wreath. Most of us have Rosemary growing in our gardens, but if it’s not growing in your garden someone you know will be growing it. 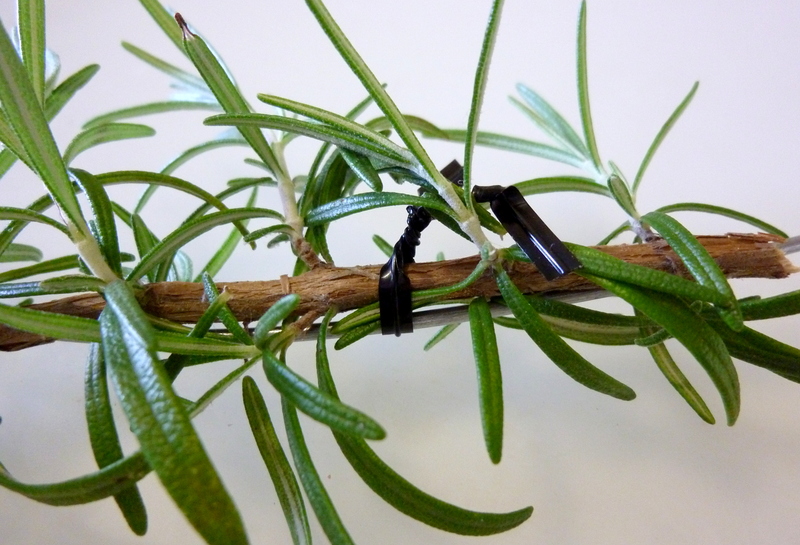 Like any plant Rosemary likes a prune, it promotes vigorous new growth and keeps the plant from getting to big and messy looking. Our Rosemary needed a prune so I decided to turn the cuttings into a beautiful Christmas Wreath. It was easy, it smells delicious, it got me away from my desk and out into the garden and the wreath will last for a very long time. 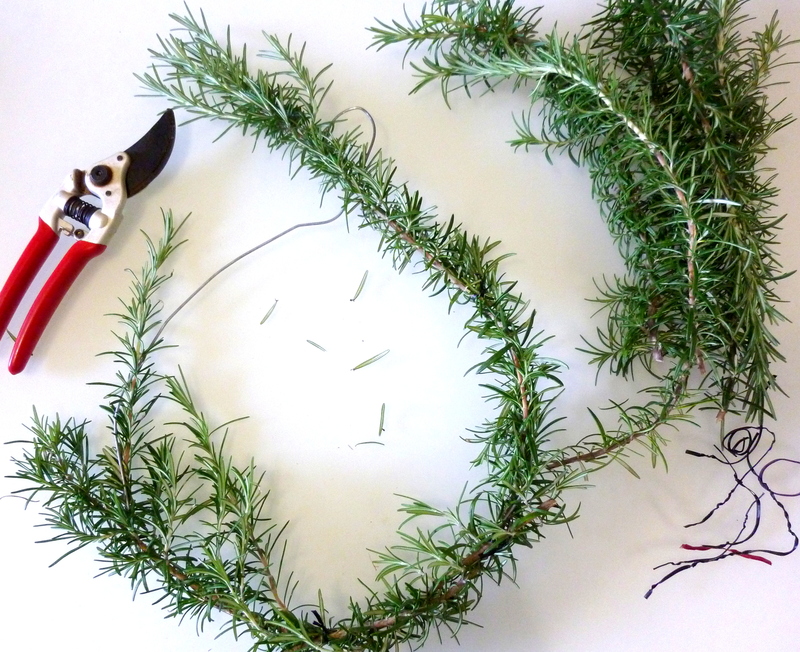 Start with your first peice of Rosemary and tie it loosley to the coathanger circle (if you missed the ‘make coathanger in to circle’ step you’ll have a funny looking wreath, you may not even be able to call it a wreath). My coathanger was round but there is a very obvious ‘edge’ to it, but who wants store bought perfection anyway! I wound white satin ribbon about the hook of the coathanger, this way it becomes invisible. But you can use any colour ribbon or any type of material or string – be creative! 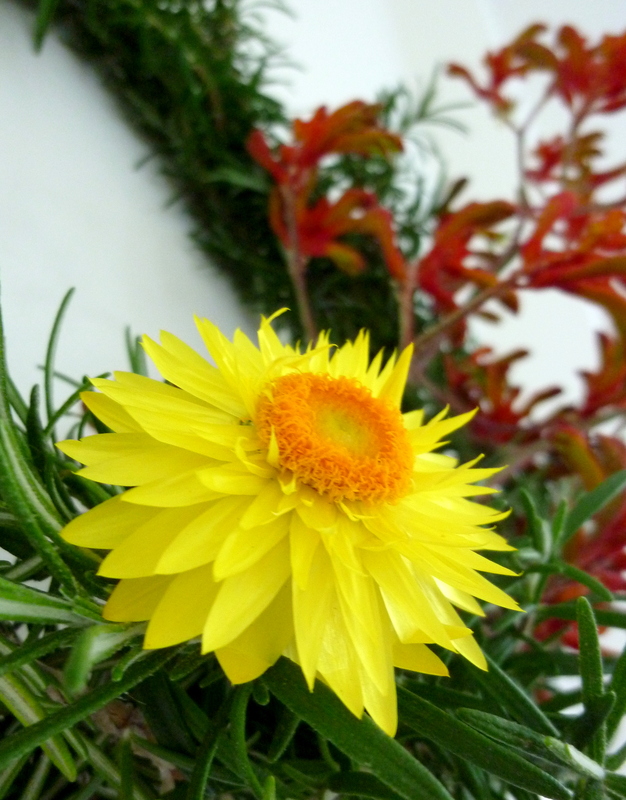 I thought the green needed a little extra zing so I picked a few Yellow Paper Daisies from the garden and weaved the stems through the Rosemary. These Paper Daisies will last (ha ha, Everlasting Daisies) for many weeks which is why I chose these flowers over any other from the garden. If you have water reliant flowers in your garden it is probably best to wait until Christmas day before cutting them and decorating your wreath. But if you can’t resist decorating your wreath just keep an eye on the flowers and change them over when necessary – just don’t run out of cut flowers before the big day. 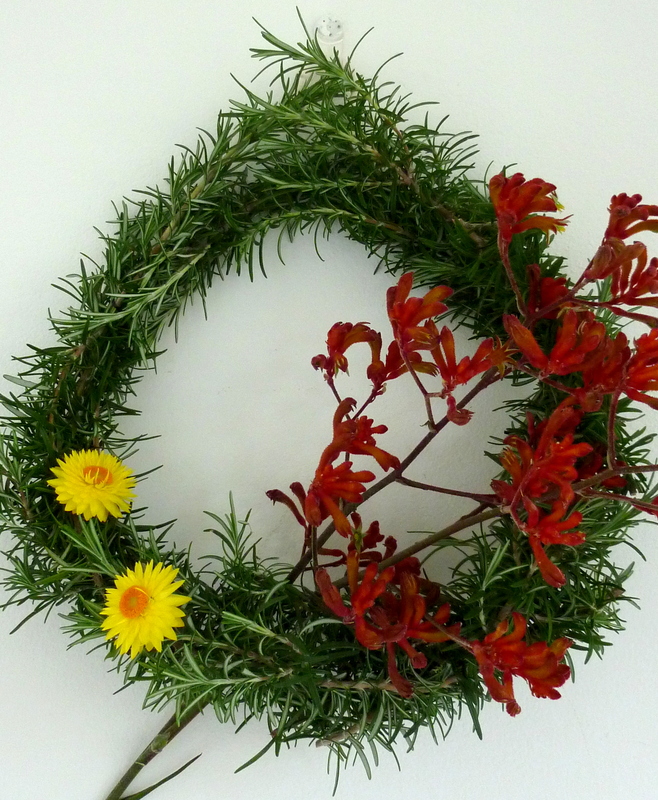 I also cut some bronze orange Kangaroo Paw for my Christmas wreath, I just love the vibrancy of the orange with the green of the Rosemary and the yellow of the Paper Daisies. 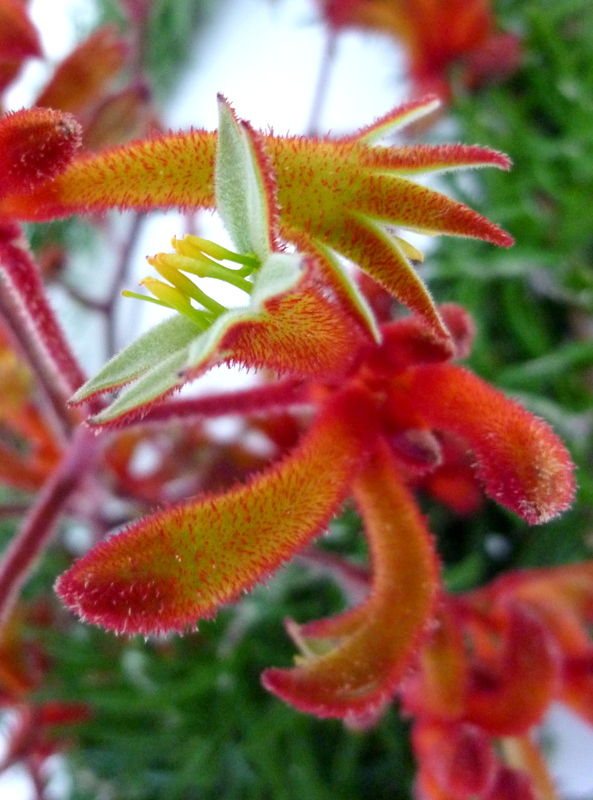 This flower will also last for a long time but I am giving it a helping hand and have it in a vase for the time being. It’s being to look a lot like… a home made creation! I feel it unnecessary to point out this blaringly obvious point but I will. 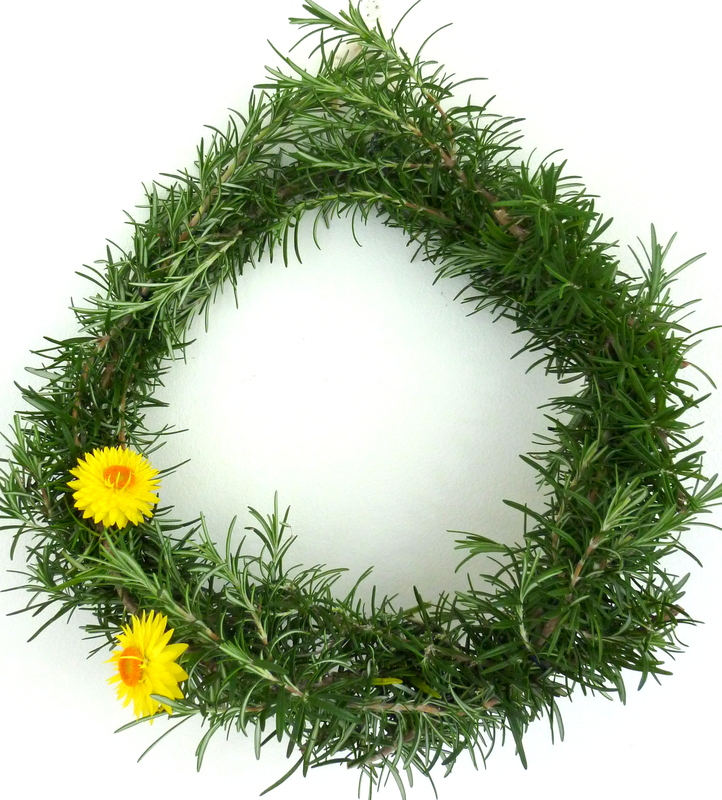 When Christmas is done and dusted and all the beautiful decorations come down your Rosemary can continue life as BBQ accompaniment, just pop the wreath near the BBQ and pull off sprigs as you need. There you go a vegetarian helping all you carnivours with edible delights. And that my friends is my contribution to Christmas creativity. I hope you enjoy the lead up to Christmas, enjoy the anticipation of the celebration that is family, friends and summer or winter, depending where you are.